I read with intrigue when MOE announced that they would be merging 8 junior colleges due to the lower student take-up rates, a consequence of declining number of students due to falling birth rates. If the problem is the lesser number of students, why then does a small country like Singapore need 2 Education Ministers who are paid more than a million dollars each every year? Why do we downsize our schools, merge them but fail to merge the needless, extra leaders at the top? What need exactly do we have for 2 ministers when there are less educators to manage and less students to care for? 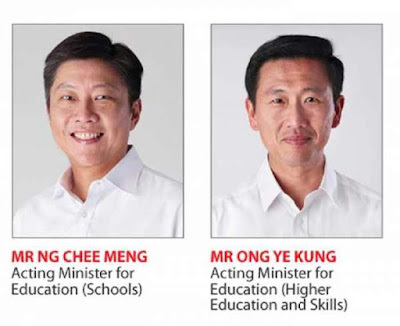 I think it is only fair to have only one Education Minister as the other is excess fat that needs to be trimmed, just like our schools which MOE has so brilliantly done. Apply the policy across the board and do it to the elites who are highly paid, be fair to all.